Like the thousands at the India Art Summit, I too was looking for my ‘moment of connection’ amongst those innumerable pieces of art, that kept passing me by, and as I kept passing by them. 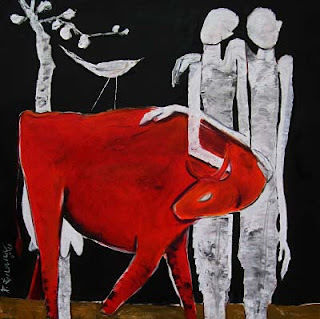 And when I found it, it hit me, forcing me reconnect with my own cultural self and its connection with themythologically revered Indian Cow.The work was titled, ‘Eternal Companion’ and the Singapore based artist was P.Gnana. The simplicity of the work hit me the most, and left me marvelingat the seemingly deep bond the artist seem to share with Cows. As an Indian, my mind traversed the holy associations with the Cow, and their symbolic value. But ‘Eternal Companion’ was an interesting depiction of these holy cows and their connection and life on Earth as companions to Humans. The paintings by themselves were rich with bold colourls, but were juxtaposed with the bony outline of the Cows, their melancholic eyes, that reflected the miles of misery on the Earth. The Cows and the human figures were depicted entwined in an embrace that left me wondering how natural this relationship seemed, and how far we have left it behind in real terms. Gnana, to my mind was attempting a perfect balance and an eternal bond between the two in an attempt to capture what seemed like an eternal moment of connection amidst unending misery of life on earth.